That would offer advantages and an easier experience than the traditional mapmaking methods used during the American Civil War. Sketching from a high peak might be helpful, but what if the mapmaker could drift above the trees and hills? New technology employed by the Union during the conflict offered the chance for the historic moment of creating a map while actually airborne! 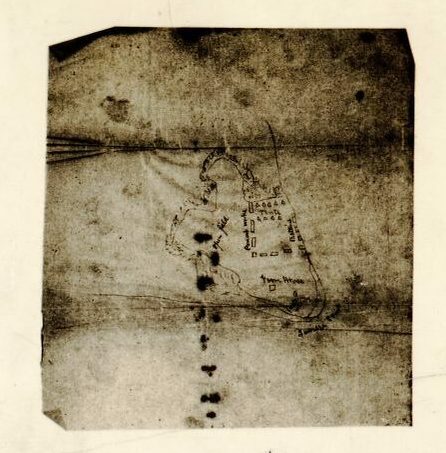 Today, we’ll talk about the Union Balloon Corps and the man who made the first known map sketched high above the ground. During the antebellum period American and European adventurers and scientists refined the ideal of using balloons to drift in the sky. Some went for the sake of excitement while others searched for practical uses for this technology. 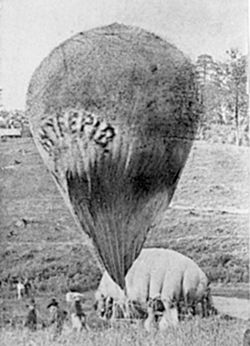 During the Civil War, a handful of balloon aeronauts volunteered their equipment, skills, and innovative ideas for the Union cause. Free flight or tethered flight became a debate as they vied for the most successful flights to look at the Confederates and report on the enemy’s movements and positions. Used primarily near Washington D.C. and during the 1862 Peninsula Campaign, the Union Army Balloon Corps brought valuable information to military commanders and pioneered ways to use the developing aviation ideas in warfare. On August 10, 1861, John LaMountain ascended and made the first known/preserved map sketch by aerial reconnaissance. Who was this guy? Was he friends with Thaddeus Lowe or part of the Union Balloon Corps? Born in New York state in 1830, John LaMountain had a difficult childhood but dreamed of becoming a balloonist. He didn’t do inventing, but tended to use science and ideas put forward by others to advance himself. In 1859, LaMountain joined another opportunist balloonist and tried to cross the Atlantic Ocean. However, the journey started in St. Louis, Missouri, and the balloonists and their passengers never made it to the coast; they made a crash landing in New York after a nearly twenty hour flight. The only good thing from the failed venture? LaMountain got to keep the balloon, called the Atlantic. When the Civil War began in 1861, LaMountain rushed to the Federal capital, anticipating his appointment as Chief Aeronaut. However, he wasn’t the only American balloonist hoping for the position, and in the end, Thaddeus Lowe achieved the official post. Still determined, though LaMountain managed to make friends with General Benjamin Butler at Fortress Monroe on the Virginia Peninsula and made some of the first aerial observations of the war. Ill luck followed this independent balloonist, though. He lost his new observation balloon, and when Butler was relieved of command at Fortress Monroe, LaMountain lost his job and benefactor. He got an assignment with the Balloon Corps, but that meant he had to work under his rival, Lowe. The two men quarreled continuously. When their power game and poor relationship reached the press, Union General George McClellan stepped in and dismissed LaMountain. 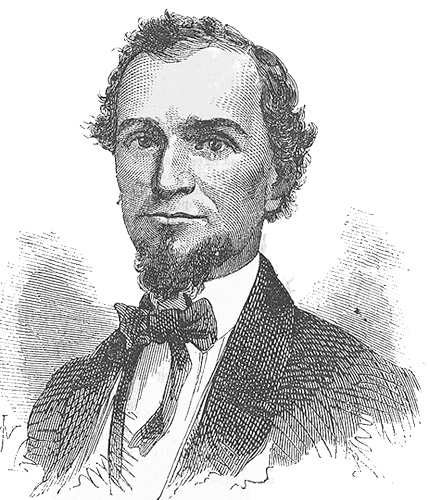 Although his army career was brief, John LaMountain did manage to claim two achievements before his rival. He made the first report of useful intelligence about the enemy from aerial observations and sketched one of – if not the first – map of a position and enemy movements. This map has significance since it is the first known map from the Civil War to be sketched from the sky! As the Union engineers, topographers, and cartographers worked on detailed and accurate maps of Virginia, balloon observations added to their knowledge and helped to refine the maps – especially in the Northern Virginia region. These flights and opportunities during the Civil War can be seen as important forerunners to later conflicts when other aero technology would be employed to further change warfare, spying, and imaging of the land below.